The Gold Coast Aquatic Centre is one of the Gold Coast 2018 Commonwealth Games™ Legacy Projects and provides a new world class facility for the Gold Coast community. The development consists of a new 10 lane, outdoor, 50 metre competition pool surrounded by an elevated spectator concourse/viewing terrace with new change room, gym, toilet facilities, community meeting rooms and event facilities. The existing eight-lane 50 metre pool, 25 metre pool and dive pool have all been refurbished and new training and learn to swim facilities have also been constructed. 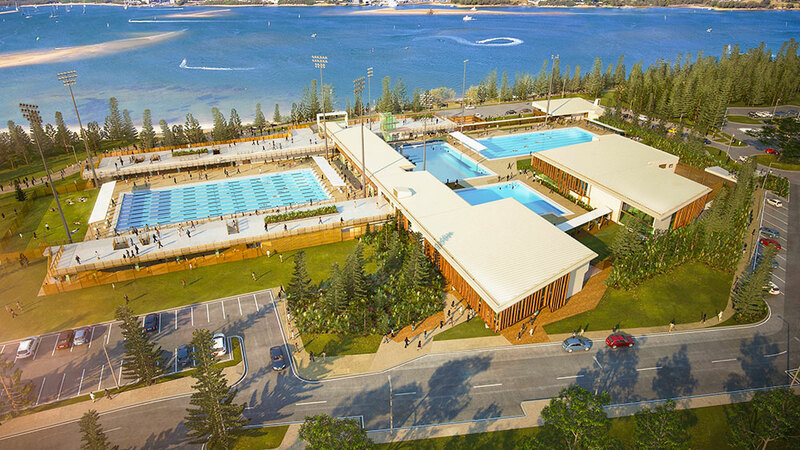 The construction of the Gold Coast Aquatic Centre commenced earlier than the other Legacy projects to take advantage of the opportunity to host the 2014 Pan Pacific Swimming Championships and other major national and international competitions ahead of the Gold Coast 2018 Commonwealth Games. Construction commenced in March 2013 and the new Gold Coast Aquatic Centre opened to the community in spring 2014 following the Pan Pacific Swimming Championships.